It is time for another Read Aloud Thursday over at Hope is the Word! No, it's not July. Do not let your eyes deceive you. (It may feel like July though the way this year is flying by. But then the overcast sky and rain convinces me otherwise.) Despite the fact that this is NOT the month for our annual Chronicles of Narnia Reading Challenge, I just wanted to read Narnia. We went on a weekend vacation in February and I snatched our copy of The Magician's Nephew and threw it in the suitcase, little knowing whether we would have a chance to get to it. Turns out we did! Of course, once you start a book you can't stop it, exactly, so we finished it upon our arrival home. If you are unfamiliar with The Magician's Nephew , it's the first book in the series, speaking chronologically. It's the sixth book published in the seven book series (now featured as "Book 1" in modern publications) and the second book that Lewis wrote. It is a prequel to The Lion, The Witch and the Wardrobe and was written as a result of a friend's question to Lewis about the lamp post. There are all manner of opinions as to when you should read The Magician's Nephew if you are reading the series for the first time. Do you read them in the order they were published? Or chronologically? How did Lewis intend for them to be read? I used to have a very strong opinion on this matter but I've forgotten what it was. Which is why I was allowed to read it aloud with my children as their fourth trip into Narnia. (We've started with The Lion, The Witch and the Wardrobe because I think that makes the most sense of the books for smaller children. We proceeded on to Prince Caspian and last summer we read Voyage of the Dawn Treader.) I was curious to see what Bookworm1 would think of The Magician's Nephew . I wondered how easily he would make the connections but he followed along quite well. In this book we find out how Narnia was created. We meet Digory Kirke and Polly Plummer who are exploring a system of attics when they stumble into the study/laboratory of Digory's eccentric and rather frightening Uncle Andrew. Uncle Andrew has been exploring how to get into other worlds by use of some magic rings but he is too scared to test the rings for himself. 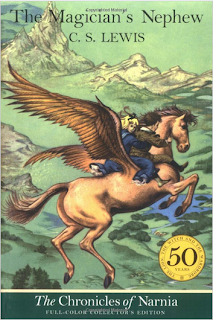 Instead he tricks Polly (and through her, Digory) into using the rings to see exactly how safe and easy it is for creatures to hop worlds. Uncle Andrew is described as a magician, but he's the cowardly type who lies a great deal and hasn't the gumption to try his own experiments for himself but instead manipulates those who he feels are weaker than him into doing what he is too afraid to do for himself. Digory and Polly find themselves able to enter many words with the rings and in their explorations they awaken a great queen who recognizes that they used magic to get into her world and bids them to take her to the magician with the power to have sent them to her land. In the end, hopping worlds proves to be more magic than Uncle Andrew can handle. However, the children are able to witness the creation of a new land which is - of course - Narnia and we are given front row seats to discover how the lamppost came to be there and who the White Witch is and how it is that talking beasts were created, etc. Throughout the story I loved asking Bookworm1 where he saw connections between this book and The Lion, The Witch and the Wardrobe. He didn't make connections for the Professor but he did instantly pick up on the magic of the Wardrobe and he identified the White Witch straight off. That was just a delight. I think it gave him a fuller picture of what Narnia is. He didn't seem as excited or enthralled by this story as some of the others we have read (he rather favors Prince Caspian - battles and bad guys) but he did laugh a time or two at this one. He especially got a chuckle out of the animal's treatment of Uncle Andrew and burst out laughing when the birds began diligently dropping words on his head. "Oh shut up!" said Digory. "If you had any honor and all that, you'd be going yourself. But I know you won't. All right, I see I've got to go. But you are a beast. I suppose you planned the whole thing, so that she'd go without knowing it and then I'd have to go after her." "Of course," said Uncle Andrew, with his hateful smile. Digory really took a chance in saying that to Uncle Andrew just as any of us take a chance when we confront a sin issue in someone's else's life. Pointing things like this out is a scary thing to do because most of the time the person seems to respond in anger and feels the need to viciously retaliate in some form or fashion. And yet what are we as Christians supposed to do when we see a sin issue in the life of a brother or sister? Well, first, examine your own heart. But you shouldn't stop there saying, "Well, I'm sinful too." True. You are. We all are. Which is why God gave us to each other to point these things out and to helpful instruct, guide, correct and love one another as we are constantly being made more like Christ. And just like that, Uncle Andrew had hardened his heart, and instead of acknowleding and confessing his sins as he ought most hastily to do, he points his finger back at Digory. "Would it be better to worry about your little friend?" And isn't that what sinners always want to do? We do not naturally desire to look at our own hearts and weed out sin. Instead we like to think that we're doing ok and if someone should address a problem area they see in our lives, we are very quick to explain it away and suggest they refocus their attentions elsewhere and on other things. That is not a healthy attitude or a right one though. Hard as it is to accept, God put people in our lives to help us along in our spiritual walk and when they come to us to address issues, we should humbly listen and examine whether they are right or wrong and make changes accordingly. More often than not, they are probably right and our pride just doesn't want to accept the gift that is their correction. Once again I really enjoyed being able to take my kids on a journey to Narnia with me. I really love this series for the adventures they send us on and the things they help me to see a little bit more clearly. I am always sad to come to the end of a tale. But then there is always another to look forward to. Over and over again. We'll be back for more Narnia in July! I *think* that's my next book in the series. I like reading them in the order Lewis wrote them. I don't think I'd care as much about the creation of Narnia if I hadn't read The Lion, the Witch, and the Wardrobe first. Good thoughts about confrontation of sin. We do too often get offended or dismiss it rather than examining our hearts to see if there is any truth to it and dealing with it. My oldest loves this series and the two middle ones have favorite books in the series, but I can't seem to cultivate an appreciation for them. Narnia is such a wonderful series. Your kids are lucky to have a mom like you sharing it with them! Even though these have been read over and over again here, I just might have to grab it for our next read aloud. I'll confess I like Magician's Nephew more the older I get. I read it to my girls a couple of years ago, so it's definitely one we will need to revisit as they get older.